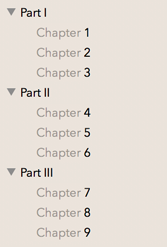 In Vellum, your chapters are automatically numbered. Numbering settings control how this numbering is performed. 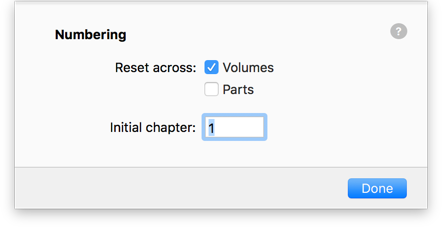 If you’ve organized your chapters into Parts, or you are making use of Volumes to create a Box Set, you can make use of the Reset across options for these elements. Note: this only affects chapters that are grouped within a Part or a Volume. If you’re not seeing a change, make sure your chapters are correctly nested within a Part / Volume, as seen in the screenshots above. By default, the first chapter of your book will be Chapter 1. You can change Initial chapter if you’d prefer a different first chapter number, like if you are producing a separate volume that begins on a later chapter.